On Jan. 23, 1943, my uncle, Frank Ebner Gartz, (photo in uniform, above) reported to the draft board in Chicago to start his training for WWII. So began the correspondence between him and family & friends, comprising almost 300 letters going both ways. I’m posting many of these World War II letters, each on or near the 70th anniversary of its writing. To start with his induction, click HERE. This blog began in Nov., 2010, when I posted a century-old love note from Josef Gärtz, my paternal grandfather, to Lisi (Elisabetha) Ebner, my paternal grandmother, and follows their bold decision to strike out for America. My mom and dad were writers too, recording their lives in diaries and letters from the 1920s-the 1990s. Historical, sweet, joyful, and sad, all that life promises-- and takes away--are recorded here as it happened. It's an ongoing saga of the 20th century. To start at the very beginning, please click HERE. Bags packed. Ready to go. Hugs, and tears and kisses all around. “I’ll write as soon as I can,” Lisi says to her father, sisters and brother. 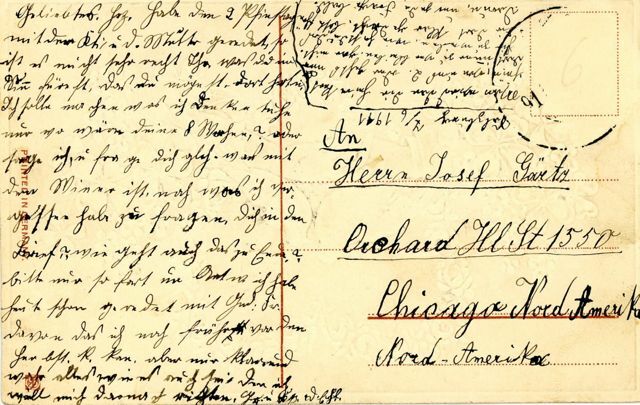 I can imagine the scene when my grandmother, Elisabetha (Lisi) Ebner departed to meet her love, my grandfather, Josef, in Chicago--a century ago this summer, but I didn’t know the exact date she actually left her hometown of Grosspold, Austro-Hungary (now Romania) for America. I had the date and time of her arrival in New York as well as the ship on which she arrived -- she wrote those details on the back of a postcard, which I’ll share in a future post. But then I found the tiny book, just 2.5” wide, 4” tall, with its stark, unlabeled, black leather cover. When I had first perused the pages, (when? Ages ago!) lined like graph paper, it seemed a record primarily of addresses and unrelated numbers. With scores of letters waiting to be deciphered, I decided decoding the little book wasn’t a priority. on the left, probably after arriving in Bremen. But recently I looked at it again -- and with an eye more trained in the old writing, I knew I had another example of my grandmother’s amazing compulsion to record her life. Amerika: The major clue that I was onto something. 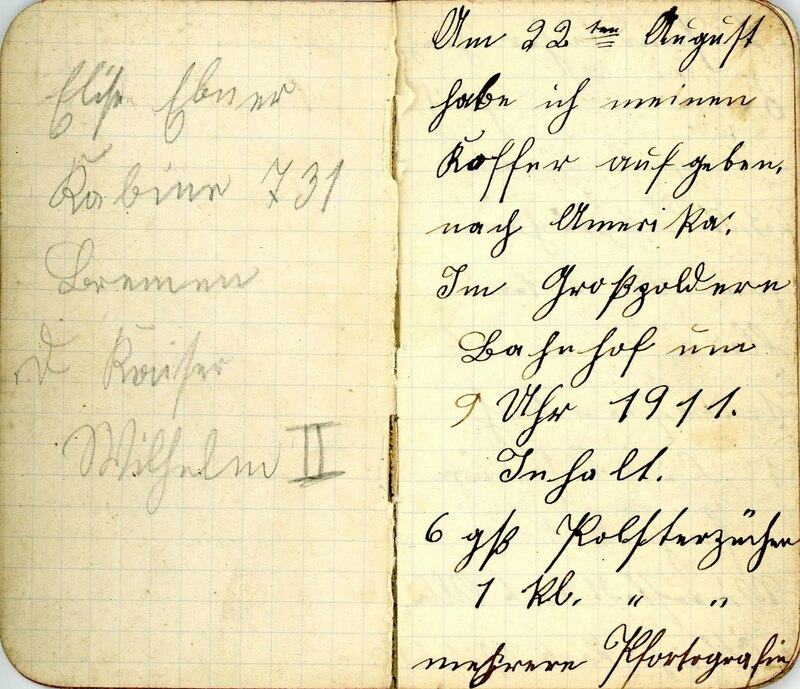 It was Lisi’s diary of her train trip from Grosspold to Bremen. I scanned it immediately and sent it off for “decoding" to my ninety-year-old German Rosetta Stone in Germany. I’ve translated as best I could a rather confusing conglomeration of train schedules, addresses, expenses, and, possibly, an early version of networking. 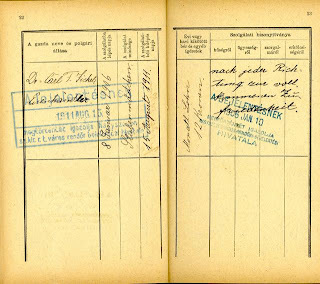 On the 22nd of August, 1911, I brought my suitcase to the Grosspold Train station at 9:00. A joke book (Could it be the book of jokes and songs that my grandfather, Josef, had created in the summer of 1910 (See the post, Drafted 100 Years Ago). A Grosspold Costume without the shirt (probably just the skirt and apron. Here she is in her “Grosspold Costume,” at left. My guess is that this is only one of several suitcases or trunks she took along, for it's only homemaking or practical items. But it's the first step in a 5,000 mile journey to meet my grandfather, Josef Gärtz. On the way, she will keep track of every stop the train makes, how much she spends on food, small gifts, and souvenirs. She writes little of what she sees, and nothing of emotions or impressions. Perhaps it was too hard, at that time, to express herself in writing, having had so little opportunity to practice. I doubt she had written much beyond lists, basic instructions, and the letters to Josef since she had left school after the fourth grade. Her life had been filled with “productive” work. Time to just “write” for pleasure or art was non-existent--and probably never even occurred to her. Yet she was compelled to write, and here began her penchant for recording details and eventually evolving into a prolific correspondent that kept her in touch with loved ones for nearly seven decades. In future posts we’’ll follow Lisi on her journey, and find out how Mrs. Jickeli, her former employer, even after her departure, took care of important business for Lisi. recommendation (Zeugnis-below), and her household help. Berta's daughter, Lisbeth, is at washtub, right. Dec.,1910. The above photograph was signed on the back to my grandmother from Mrs. Jickeli, in December, 1910. (For details about what had been unseen for almost a century, written on the back of this photo, see post, Hidden Message Behind Women's Work.) It hung prominently in my grandmother's home for her entire life. I can imagine the immense sadness she felt as she prepared to say farewell to this woman and her little daughter, Lisbeth, both of whom she loved like family. Mrs. Jickeli had taken Lisi under her wing for four years, and now this young woman of 23 was making what seemed to the forty-six year old Berta, a rash decision--taking off for America without knowing how long she'd stay or if she might return. As she prepared for her journey, Lisi knew she would have to find a job once she arrived in Chicago, married, and settled in with my grandfather, Josef. Besides her Dienstbuch (record of all previous employment - see post: When a resumé worked as a passport, what else could be more important that a personal recommendation? That’s exactly what she received from Mrs. Berta Jickeli. “Zeugnis" means "recommendation. It’s a glowing report which must have made my grandmother’s heart swell with pride. She saved it her entire life - and now I have it, this century old tribute to my smart, hard-working grandmother. 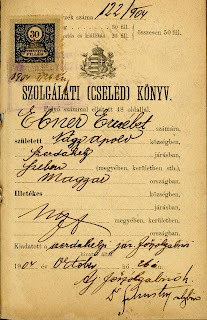 The undersigned at the end [of this document] certifies herewith that Eliesabeth [also spelled Elisabetha] Ebner from Grosspold (Nagy-Apold), Hungary, first worked for me as a parlour maid and later as cook from January 8, 1906 to August 15, 1911. During this time, she has always been honest, upright, industrious, and faithful, and for every duty has earned my fullest satisfaction. She is superbly qualified for childcare and illness duties and is well-trained in all household work, and I can therefore most heartily recommend her. At the bottom, in purple ink, is an official stamp of Hermannstadt, and the document is countersigned by what is our equivalent of a notary. I can only imagine the conflicting emotions Lisi must have suffered through as she put all her affairs in order: excitement, fear, anticipation, and sorrow, knowing she may never return to the beloved Jickeli household, her father, her sisters, and brother. She didn't write about her feelings. Perhaps she thought that was too self-indulgent, but she did record much about her trip, beginning with the delivery of her luggage to the train station in Grosspold--followed by details of her journey. Coming up: Lisi's diary -- from Grosspold to Chicago. I'd love to hear from any of you who have a document related to your ancestors in which they (or you) would take particular pride. Please click on the word "comments" below center. Thanks for reading! 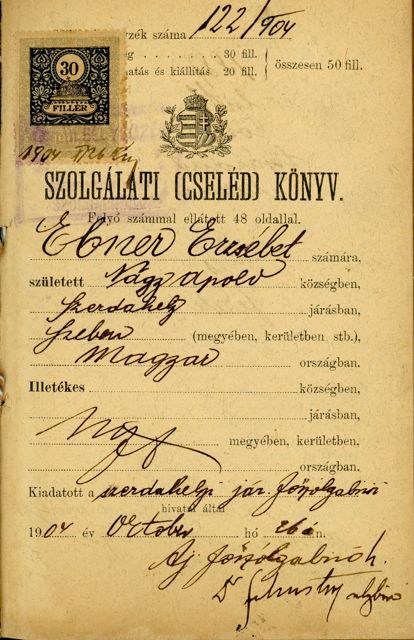 I can't read most of the lines in the "pass" because all is in Hungarian (In 1911, Siebenbürgen/Transylvania was part of the Austro-Hungarian Empire), but things like her town (Nagy-Apold -- Hungarian for Grosspold) and dates can be made out. I always assumed (because of her note) it was a true blue passport, but I've learned it was actually a “Dienstbuch,” literally a “service book.” We can consider it a kind of “resume.” In it are listed her various employers, when she started working for them, her job, and even salary. Because of its official nature, (the first page is stamped by the local police! 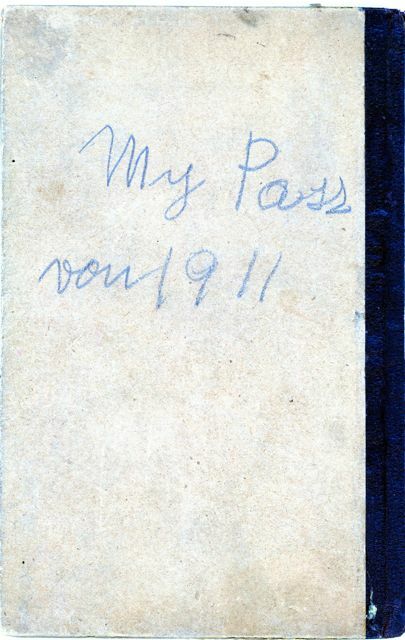 ), it appears to have also been used as her passport, per her own note. whom she corresponded for sixty years. This method of keeping track of employers seemed to be pretty common (See my post of May 4th, Happy 125th Birthday). My maternal grandmother, had the same type of book, but in Austria it was called: Arbeitsbuch, literally her "Work-book"). 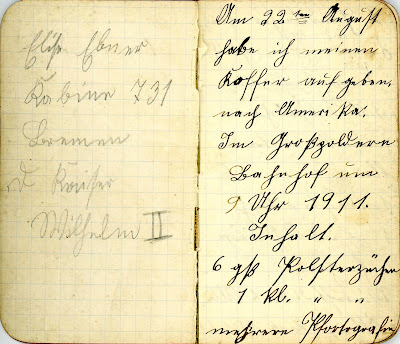 The first entry listed In Elisabetha Ebner's "Work-book" is from January 1, 1903-December 31, 1904, when Lisi was ages 15-17. The next two pages have been filled out by Dr. Carl F[riedrich] Jickeli, (left) Eisenhändler (hardware store owner). I recently learned this was far more than a hardware story, however. It was a kind of department store in the center of Hermannstadt (Sibiu) where you could buy everything from kitchenware to tools and nails to clothing. 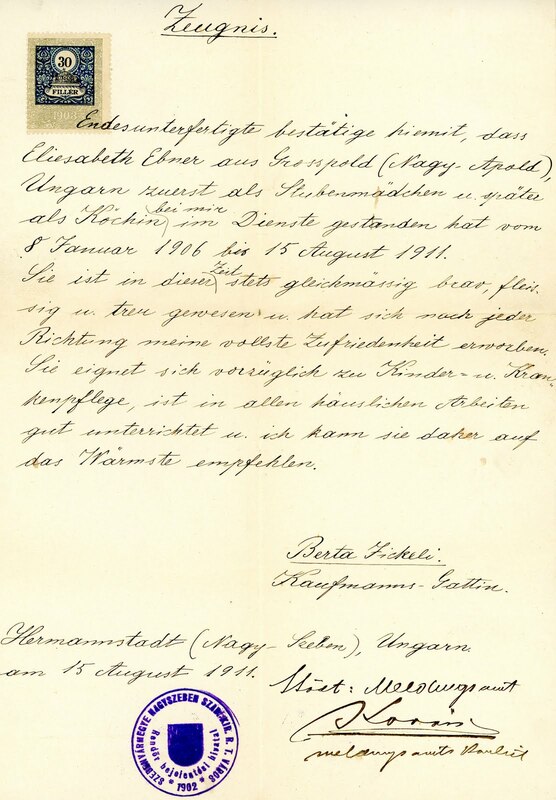 Lisi actually worked for Carl Jickeli's wife, Berta, from January 8, 1906, to August 15, 1911, (ages 18-24) as a Stubenmädchen (parlor-maid--a good position). Monthly salary: 12 Kronen. She must have also been given room and board, as she was eighteen miles from her home in Grosspold, but it still doesn't sound like much. The left page is stamped with the final date of her employment: 1911, Aug. 15. On the right page is hand-written: [Wishing you] complete satisfaction in every path. For more than five years Lisi was Mrs. Jickeli's right-hand gal. Her role evolved far beyond that of just a maid, as future letters, revealed. Mrs. Jickeli entrusted her with the running of the household when she had to be away on business, and most importantly, entrusted her young daughter, Lisbeth, to Lisi's care. 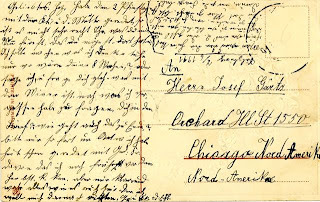 As she prepared to leave the woman she considered a second mother, Lisi would turn to Mrs. Jickeli for a very important document to help her find work in the far-away land of America. Coming up --"The Recommendation." 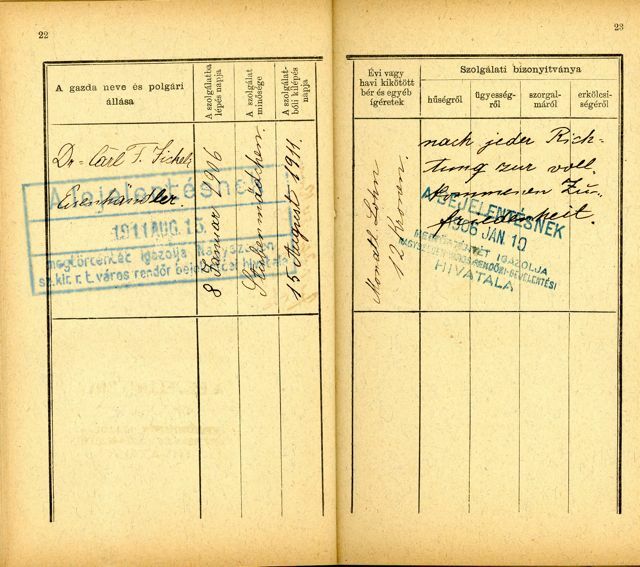 I’m curious as to what sort of passports any of my readers may have from their ancestors. Do they seem to be uniquely a passport -- or did you find an "employment book" as well -- that might have been used as a passport? Are we going there to stay? This strange land of America is so confusing: even the addresses make no sense. What part goes where? Despite the fact that she mixes up the street, state, city and house number on the postcard, it still gets to Josef. His heart must soar. Lisi is coming to America to marry him! She writes this postcard from Salzburg, where she has undoubtedly joined her employer, Mrs. Jickeli, at the family's summer home. 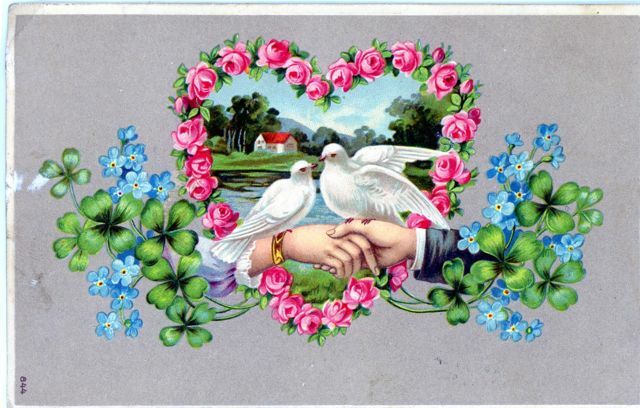 Some background notes: Pentecost (celebrated the fiftieth day after Easter and marking when the Holy Spirit descended upon Jesus’s apostles) was a holiday in the Evangelische Lutheran church worth mentioning in her letter. I have spoken with Kathi and mother on the 2nd Pentecost day. Am I right -- that you want to marry there [in Chicago]? I should do what I think is right. How will [the trip] work out in the end? Is there anything I’ve forgotten to ask you in the letter? Please, answer me immediately. I have already spoken with the madam [probably her boss, Mrs. Jeckeli] that I could leave before autumn. But please let me know clearly what I must do. Then I will make all the arrangements. When will we two return home? Or are we going there to stay? What is your thinking about that? Please answer every question soon. Despite not knowing if she is going to live in America just for a short time -- or for the rest of her life, Lisi is taking the plunge. What she takes on her journey -- coming up. I look forward to your hearing from you. Please click on the word "comments," centered, below this post and leave me a message. You do not need to sign up for anything or have a URL (website) -- just fill in whatever name you want to use (or anonymous), comment, and click "post comment." Easy! "Wouldn't all of us love to have a journal, a memoir, a letter, from those we have loved and lost?" Family Archaeologist is a blog exploring a century of family letters, diaries, and artifacts, and how they illuminate history and our shared humanity. Linda is digging through a century of letters, diaries, and artifacts to piece together her family's life as it was lived and reported on at the time. She's sharing her discoveries on this blog, hoping others find resonance with their own families -- and the human experience. A writer and television producer, she is turning her search and discoveries into a memoir. Thanks to Nancy at My Ancestors and Me. Click on award to link to her site. ©2010 Linda Gartz, all rights reserved. No portion of this blog may be used without permission.